I love to clear clutter and be organized. The joke around my house is you need to guard your drink glass because mommy will take it and wash it before you are done with it. Or mommy will recycle the newspaper before anyone gets a chance to read it. Every once in a while I go through my house and find the furniture, clothes, or miscellaneous items that are not being used and donate them or give them away. If the item can be used or re-purposed in a different way, then it gets to stay. 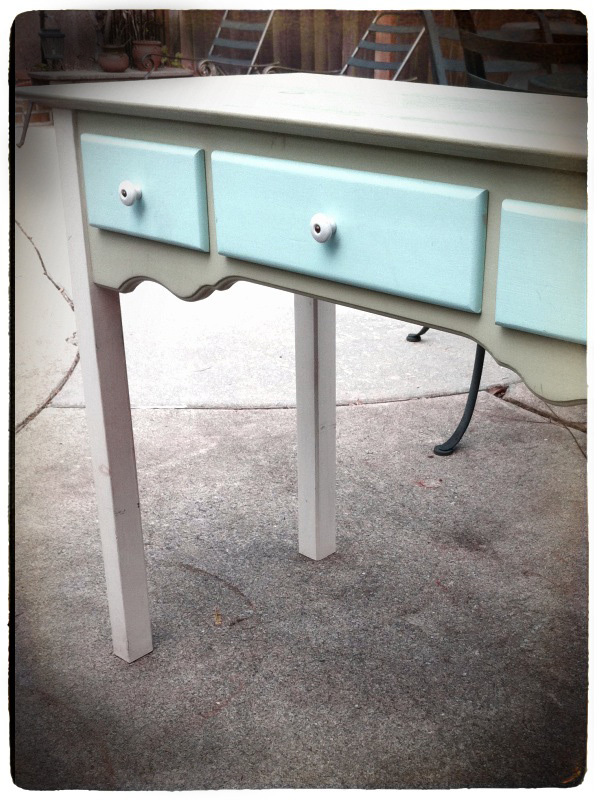 In my garage (where said items sit in limbo) was this semi-ugly unpainted vanity that was waiting for it’s fate. I was hugely pregnant with my first baby and due any moment. We were shopping around for a changing table and choking on the high prices. 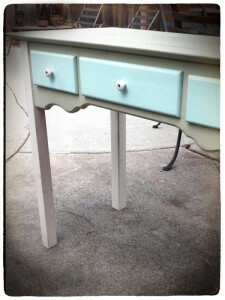 I decided that this old vanity was the perfect hight for a changing table and the drawers could be used for storage. We took off the mirror and painted it the colors of the nursery, sage green and light blue. (In before photo). It worked well in both of my kids nurseries. When we decided to redecorate their nurseries to be kid rooms, the changing table was in the way and ended up in garage limbo-land again. 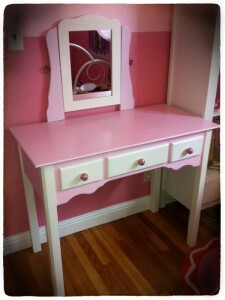 My daughter wanted a desk or a vanity for her new big girl room. 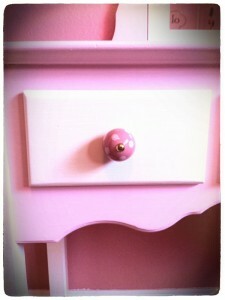 Enter the old vanity turned changing table. We painted it pink and white to match her new room, put the mirror back on and turned it back into a vanity. I used the leftover paint we had from painting the walls in her room. I purchased these pink and white polka dot drawer pulls on sale from World Market for as an accent to match a polka dot rug from Potterybarn Kids. (We do splurge sometimes). In the end she loves it and I saved money. Everyone is happy.